only an economic novice - ie an HPer - can think oil won't fall of a cliff price wise some time soon. "Cable TV was one of the family's budget-cutting casualties, leaving Sadie, 9, and her 7-year-old sister without their favorite cartoons and shows." Damn, you mean they might have to go outside and play? Oh the humanity. Hey if those prices were that cheap anywhere in Europe you'd have riots and 5 mile queues. So what's the problem? Stop cruising aimlessly and you'll be fine. I kind of agree with the chatter that oil looks like it is in a bubble -- but only for the short term. As with real estate, price is set on the open market, but with certain interests exerting a bit of upward influence (OPEC, runaway consumption, speculation, etc.) leading to profits for some. Also, oil supply is finite (Remember, they are not making any more land!) so as demand increases prices naturally go up -- it all perfectly parallels the real estate joke we are still laughing at. But unlike real estate, bringing in another truck full of illegal laborers does not expand supply. A new oil field takes a good 5 years before production kicks in, and quite a bit more to reach maximum output -- and just where are these rather badly needed oil fields going to go? Sure we find new sources here and there, but it certainly looks like the vast majority of large fields (the ones where most of the worlds production comes from) have not only been found, but are at or beyond their maximum production -- in oil-speak they are "in decline". Will the world ever run out of oil? Technically the answer is "no" -- we will always be able to squeeze the rocks and wring out a bit more. Can the world continue consuming oil at ever increasing rates? I think the answer is obvious. That was a long rant, but it does put the background in place for my own opinion on the matter... Is oil in a speculative bubble? In the short term (months out to 2 years or so) the answer is maybe, and I could see prices dropping by half. In the long term, if meaningful conservation measures are not taken, I'd go all in on oil and energy on the dip, because $4-5/gallon in the US will be fondly remembered as the good old days. Receive what cheer you may. The night is long that never finds the day. This is all speculation. Gas prices aren't news, they're a waste of time. I'm doubtful that they're running out of oil. Do you really expect me to believe the people pushing peak oil? These are the same people who lie about everything. If someone lies constantly, would you believe them? I hope not. Give it a couple of years and you'll see $0.75 - 1.00 gallon gasoline in the future. If housing and the stock market go to hell, not many people have cash, so even $0.75 gallon gasoline would be expensive. "Steak was a dime a plate, but no one had a dime"
-One of your favorite sayings from the Great Depression. We supposedly are heading into another, no? It's different this time. We are running out of oil.So go buy a 1000 gallon tank and start hoarding.Bush and cheney are just laughng their asses off as all their buds get rich. Do any of you know how to short oil.I know there is an etf DUG that bets against oil.There will be money to be made on the short side.Help me! I need to pay rent and fill up this gas tank this week. 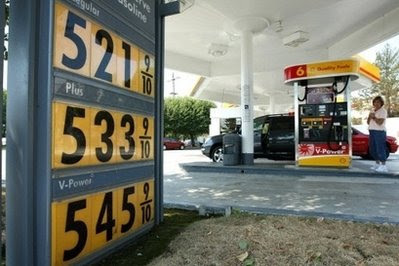 Once the housing gambler bailout is passed then gas should be $8-10 a gallon. After all, you need to pay for it. Hope you have enough for food. "If housing and the stock market go to hell, not many people have cash, so even $0.75 gallon gasoline would be expensive." That was when money was precious metal specie. In a fiat money system, when the normal free market exchange is broken down by government red tapes and predation, you end up with desperately poor billionairs, just like in Zimbabwe: a ham sandwich costs $500million! People are desperate poor because money has lost its purchasing power. Poverty should be a measure of purchasing power, not nominal amount of fiat currency; fiat currency regime can print up plenty of the latter, but can't produce the former. Purchasing power has to be provided by willing suppliers, which government rule making can't produce out of thin air. We could drill for oil on our own land, but we decide it is too precious. So we depend on OPEC and whine like sorry little babies. I'm happy for the OPEC nations and other oil exporters who are making money. They are being logical and drilling for as much oil as they can at these prices. We have the oil but choose not to drill because we feel that our land is better than the land in Canada, Mexico, Middle East, Russia, Venezuela etc. "Do you really expect me to believe the people pushing peak oil? These are the same people who lie about everything." You just go on believing the people who sold you the Iraq war, the war on terror, the war on drugs, and the oil companies. Good luck with that. Idiots don't understand what causes a bubble. A bubble is caused by false demand. There is no false demand in oil. Everything being offered on the market is being bought and used. At the same time, paper currencies are being deflated at a faster rate. I'm willing to bet anyone that oil prices will be higher in 5-10 years than it is right now. The same cannot be said of the tulip bulbs, beanie babies, NASDAQ, crackhouses in Compton etc. These idiots don't understand that a huge new market for oil was created in China and India, which have ten times more people than their imagined center of the universe, the USA. "only an economic novice - ie an HPer - can think oil won't fall of a cliff price wise some time soon." This is a statement from someone who is "geologically challenged" or who believes one can expand indefinitely with a finite resource. Minor price fluctuations in the market, but a steady upward trend in real prices and scarcity will be the rule. Why do people keep mentioning what other countries pay for gas? America pays to defend the oil fields and shipping lanes. The world does not get a steady supply of oil without America's military. The set up should have always been America pays a set low price and the rest of the world makes up the difference based on market conditions. Of course our politicians are on the take so that easy set up never happened. Do you really expect me to believe tie people pushing peak oil? These are the same people who lie about everything. No they're not. Peak oil comes from "grassroots" geologists and oil engineers in the business. I've been following the Oil Drum (www.theoildrum.com) for a few years now, starting somewhere near 2005. When oil was $75 after Katrina or something and people were blaming speculators and refining capacity blah blah blah. I remember Ken Deffeyes prediction that peak oil was 2005. So far, has not been proven wrong (we've had a flat line in total production since 2005). He's an old crusty geologist at Princeton. I remember all the EIA and major oil companies completely and utterly disputing any such peak oil nonsense. I remember Cambridge Energy Research Associates---a huge oil consultancy---insisting oil was coming back to $40, a long term price level, imminently. I remember many individual oil workers posting about their own jobs. I remember an astonishing highly-quatnitative analysis of Ghawar depletion---extracting information from 'inadvertent' pictures from Saudi Aramco---months of work by a phd physicist, and done for free. These are not kooks. Unfortunately some of the commentary now has been takenover by doomer & survivalist types, but the big picture message was clear. I don't read much there any more: but don't need to. They're right. anyone who thinks oil is in a bubble doesn't know how to recognize a bubble. a bubble is mania demand in something because it will keep going up, and for this to happen to an asset there are various conditions that need to be surrounding it. the price of oil is a reflection of a delicate balance between supply and demand, with little spare capcity on the supply side, and emerging market growth that could make demand grow far more steeply than it even is now. mix into this the rise in global inflation, pipeline attacks and possibility of the middle east erupting into a fireball and you get the price of oil today. things to exert downard pressure - produce more, temper western consumption, slow eastern growth, stop saber ratteling and smooth out middle east relations. don't see these happening? then don't expect it to come down. we are NOT in an oil bubble. just because the cost of something rises quickly and you THINK you know what the real price is and it's much lower, does not mean that we are in a bubble. this blog has even featured amazon links for books about bubbles - books whose criteria for determing a bubble have NOT BEEN MET! "The world does not get a steady supply of oil without America's military." "Hey if those prices were that cheap anywhere in Europe you'd have riots and 5 mile queues. So what's the problem? Stop cruising aimlessly and you'll be fine. Because people in Europe don't drive 60 miles each way for a daily commute. "Give it a couple of years and you'll see $0.75 - 1.00 gallon gasoline in the future." We should just make our own currency that is accepted as legal tender for goods and services. The govt. is making things worse and driving down the dollar. Make the new real money currency so a gallon of gasoline is 10 cents and $12,000 buys a new 3 bedroom house. google the term "liberty dollar"
Hummm, I don't seem to have any problems with gas prices....each of my pre 1964 quarters still buy a gallon of gas just as they ever did. Wait, you mean to tell me people actually use Federal Reserve Notes as a means to retain their wealth???? HA, well I guess they deserve what they get. There is a plan in the Senate right now that can start to bring relief in just a few years and eventually total independence from OPEC. Yet the media completely ignores it? S.2958 is the broadest energy Bill we have had the opportunity to support in decades. McCain has a "Lower gas prices" petition on his web site, why do we need a petition asking for an energy bill to lower gas prices when one already exists? Each politician wants to be the one who introduces the energy Bill that saves us, so they ignore the other guy's energy plan and the cycle repeats. The two oil men you voted into office TWICE, geniuses, have a few months left. So the oil mafia is going for the kill this year. Huge drop in oil prices by November 08. Mark my words. Oh, and don't come acting like you knew later on because I'll punch you in the mouth, just like I do to the idiots who now act like they knew all along about the housing bubble. Why is it that no one exposes the real demand growth for oil in 2007? It was a pathetic 0.9%. There's no huge demand for oil; you've been gamed. If the Fed decides to raise rates today, the economy will be less worse then leaving rates alone. If they leave rates alone it will do less damage to housing in the short term, but oil will not decline in price, also hurting the country. It's a lose-lose situation for the Fed. Serendipity at last. The Fed can't do a damn thing right now. In addition to Bernanke feeling the drill, people are being forced to drive less, fly less, and think about fuel for more then the 5 minutes then they're at the gas station. The real reason we don't drill in the US is because the oil mafia wants to keep the oil price high. If we did, oil prices would collapse. Your Congress (including your Messiah Hussein) is in the pocket of the oil mafia. The corn ethanol fiasco is just a bonus to the crooks in Congress. You mean the same piranha's mouth wife? Oh yeah, suddenly everyone realized that oil is finite. That happened in the last 8 months, after Bernanke started killing the dollar and opened the window so the crooks from Wall Street could trade their rotten Balance Sheets for oil futures. What a coincidence! Aham...got it, geniuses. "America pays to defend the oil fields and shipping lanes. The world does not get a steady supply of oil without America's military." LOL!!!! Actually the Chinese are paying for American's useless Can't Find Osama bin Laden military to "defend the oil fields and shipping lanes". While the Chinese work hard and pay our way, fat, lazy American people are driving their bought on credit Suburban Utility Vehicles from their bought on credit McMansions to the shopping malls to buy computers on credit so they can whine about their supposed high taxes. Wait till we attack Iran!!!!!! What will happen if gas prices continue to go up up up and away! What will come of all the Hummers, F-250's, F-350's, and Dodge Ram's? "Bring it on, baby, bring it on!" HA!!! You ain't seen nothin yet and I can't wait. I hope it gets to $10 a gallon. Did anyone else notice that oil prices have gone up $70 since the DemoRats took over Congress just 18 months ago? Didn't they promise us that gas would be under $2? Didn't they also promise that they would end the Iraq War? This gas station is about 5 blocks from where I live in San Mateo, CA. Absolutely nobody buys gas there, I think they're laundering money in the back. To the excellent arguments made in favor of oil not being a bubble, I will add the following bits of evidence, for what they are worth. 1) Rising hosuing prices and stock prices (bubbles) are not intrinsically harmful to other areas of the economy. Sure, in theory some people might be "priced out forever," but generally there is benefit to rising asset prices (as long as the rise continues, of course). Such increases are skewed heavily towards the beneficial, rather than the detremental, in terms of overall effect on wealth creation. But with oil, however, the opposite is true. Rising oil prices skew heavily to having a detremental effect on wealth creation. Sure, a few speculators or producers might become wealthy, but the "ripple effects" of higher oil prices are extremely negative on the wider economy. Rising home prices lift local businesses. Rising gas prices choke off demand, make production more expensive, and have a negative overall effect on wealth. This alone should tell you that something different than a bubble scenario is going on. 2) An interesting point I've noted is that the same "types of people" who were so eager to deny that dotcom stocks and housing were bubbles are now wildly eager to identify oil and commodities as a bubble. Why were they so slow to recognize true bubbles (dotcoms, houses) and now so eager to talk down rising commodity and oil prices? It's because of the negative net effect on wealth creation mentioned above. These "types" cannot stand the wealth destruction that rising commodities bring and want to get back to the "true" bubbles and ponzi schemes that make them salivate. So in a kind of demented reverse-psychology, they start howling about "bubbles" in commodities and oil, when in reality these are different types of phenomenon. The very fact that the typical shills for bubble-tude are now yapping about how oil and commodities are in a bubble should give one pause. Oil and commodity prices may be currently driven above trendline by speculation to some extent, but make no mistake, these prices are not significantly going to decline in real terms in the long run. Hope they go to $500/barrel or more so we get rid of this moronic cultural addiction to the internal combustion engine. Can't afford to fill your car? Good. Now go buy a bike and get rid of your diabetes and obesity problem while you're at it. The hydrocarbon age is coming to an end. Get over it. Stop cruising aimlessly and you'll be fine. Did you not see American Graffiti? You would begrudge me a pre-thighmaster Suzanne Sommers cruising in a '57 T-Bird? I am a Bitter Bus Rider: I laugh at all of you people in cars! Hmmm...let's see: I could get a new BMW X5 or Lexus SUV for free by taking advantage of a tax break from section 179 through my small business, which hands me $25k worth of straight line depreciation/credit for new vehicles over 6,000 lbs. Plus dealers are rolling out 0% interest deals (= free money), attractive to anyone who grasps TVM. Moreover, anyone with a functioning brain knows that oil prices will collapse by November 08. WSJ -- Sales of the Toyota Sequoia, a large SUV, rose 29% to 14,100 in May from a year earlier, making it the only vehicle in the "large utility" segment for which sales have grown this year, according to J.D. Power & Associates. Sales of the Dodge Viper, a sports car with a fuel-swilling 10-cylinder engine, more than doubled to 515. Sales for the Lexus LX SUV in the first five months of the year have more than doubled. See, some people know how to play the system, while the rest whines or waits for a handout from Hussein. Thanks for subsidizing my free Lexus SUV with your taxes, while you ride your bikes. I fill up my car about once every 2 weeks. I got gas yesterday for $3.86. Last time it was $4.02. The fall in prices is starting already. If you want to make money, load up on oil puts and you will retire very quickly. seen those motorized electric bicycles yet? price went from 200 to 500 bucks......and if in europe with socialized medicine paid out health insurance cosys ? and hospital costs and millions for for profit health care coasts and thought dee grannie had no health care lived to 100 had a doctor.....mama had heakth care...no family doctor lived to 80??? Can someone tell what per cent of the American demand for oil is military-related? It seems like if we weren't trying to take over the world, we wouldn't need so much of that stuff. buy those oil puts and you will be in the food lines at the end of the year next to the housing gamblers. BusinessWeek -- And so I give you just one week of news from the oil market. To be more exact, it's the oil news from the seven days preceding our Energy Secretary's comments about supply and demand. "Hope they go to $500/barrel or more so we get rid of this moronic cultural addiction to the internal combustion engine. Can't afford to fill your car? Good. Now go buy a bike and get rid of your diabetes and obesity problem while you're at it. The hydrocarbon age is coming to an end. Get over it." Sure John, we can "get over it" when the price of diesel becomes so high we can't afford to ship food the the stores anymore. We can "get over it" when we are living a real life version of soylent green.